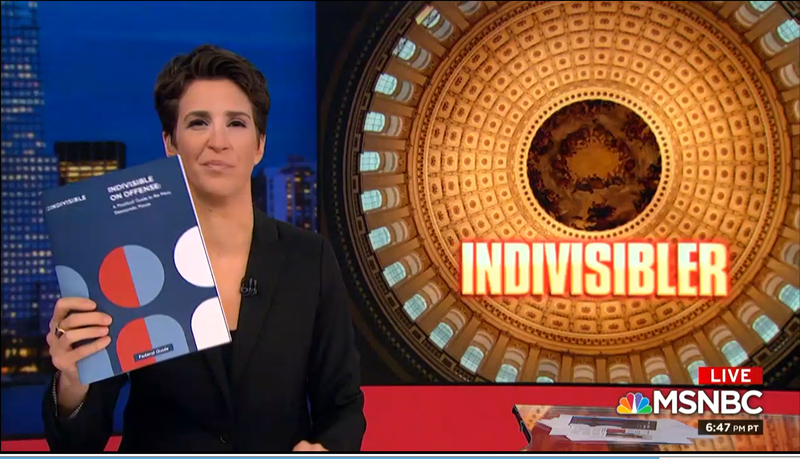 We know it’s late, but this is important: tonight, Ezra went on The Rachel Maddow Show to share Indivisible on Offense, a grassroots organizing blueprint for the next (and hopefully final) two years under the Trump administration. Indivisible States: We can seize big gains and new opportunities to save democracy and the state and local level. Click here to watch Ezra and Rachel Maddow talking about Indivisible on Offense. On January 4, 2017, Indivisible caught the attention of the entire country when Rachel Maddow invited Ezra to join her on her show. You’ve seen the clip: when Ezra first walked on set, we were 350 groups strong. But as he and Rachel talked, Ezra’s phone kept buzzing (on LIVE TV) -- each buzz signifying a new Indivisible group forming. Tonight’s interview shows just how much has changed in two short years. Our movement has helped stop some of the Trump administration’s worst attacks on democracy as we know it. And just last week, our efforts paid off: we flipped the House, six state legislatures, and moved the entire country forward. Literally none of this would be possible without support from folks like you, Mike. It’s each of us pushing a little bit harder, together, that’s going to defeat the Trump agenda. Donald Trump is the biggest popular vote loser in history to ever call himself President-Elect. In spite of the fact that he has no mandate, he will attempt to use his congressional majority to reshape America in his own racist, authoritarian, and corrupt image. If progressives are going to stop this, we must stand indivisibly opposed to Trump and the members of Congress who would do his bidding. Together, we have the power to resist -- and we have the power to win. You didn’t just read the Guide. You didn’t just start groups in your hometowns across the country. You made Congress listen. In 2017, Indivisibles went to town halls, die-ins, and district offices. We defeated TrumpCare, rallied for immigrants, and turned the Republican tax cut for the rich and corporations into an enormous political liability. We stiffened Democratic spines and weakened Republican resolve. We couldn’t stop everything -- but we did stop a lot. Indivisibles endorsed candidates, knocked doors, registered voters, phonebanked and textbanked. You dragged your friends, family, and neighbors to the polls. Drop by drop, you built the blue wave and remade Congress, state houses, and governors' mansions. And as a result, our slate of elected leaders at every level across the country will feature people who look like America, ready to fight for economic and racial justice and beat back the worst of Trump’s attacks on our neighbors, communities, and future. We start making gains in the states to save democracy. There are huge opportunities to resist Trump and provide a progressive vision for the country through state-level advocacy. And many of the same principles you use when advocating for federal change apply at the state level. 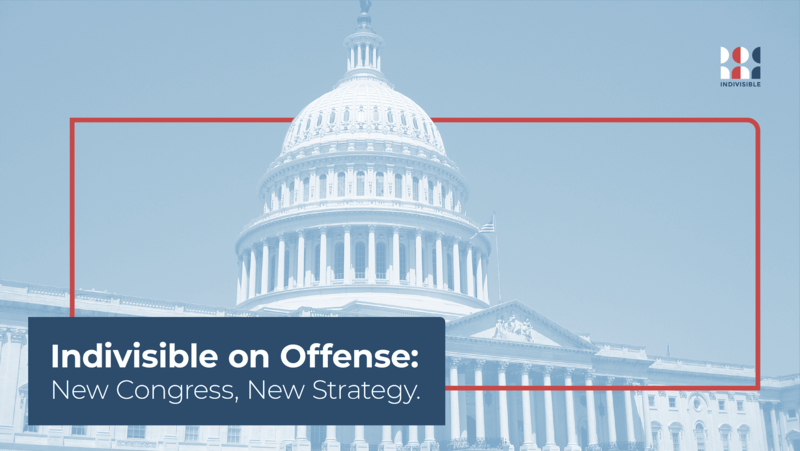 With the big gains last Tuesday, we have a lot more opportunities to accomplish proactive policy wins -- and this all starts happening early in 2019 when state legislatures are sworn in. This is the road to stopping Trump in his tracks, locking in the gains we've made, and advancing an alternative vision for the country rooted in democracy, inclusion, and respect. This is the road to retaking the White House in two years. But none of this is automatic. We won last Tuesday. Now we have to make those wins mean something going forward. Two years ago, we wrote the Indivisible Guide because we knew that everything we hold dear was under threat. We’ve lost a lot since then, but we ‑‑ along with critical partners -- have accomplished so much. We resisted. We retook power. And with control of the House of Representatives and new power in the states, we will band together, indivisible to remake this country.